Can't believe it's over, but I'm finished with Accutane! I took my last pill last Tuesday (March 19th). So I did a total of 6 months on Claravis. 40 mg for months 1 & 2, 60 mg months 3, 4, and 5. and 80 mg on month 6. 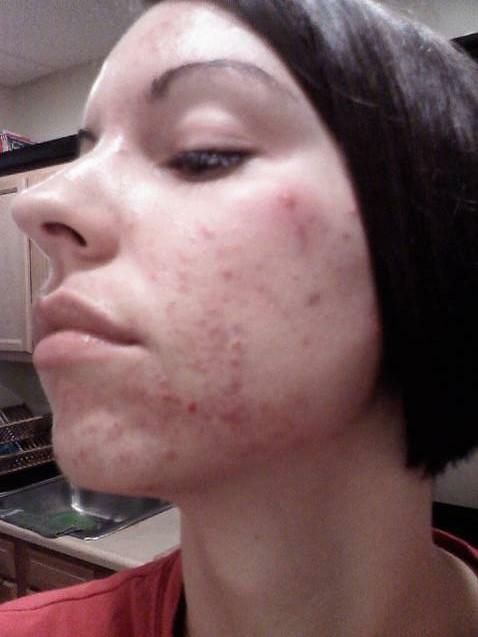 When I first started Accutane, my derm told me that I wouldn't need to use any "maintenance creams" once my course was over because "my skin will be different". But when I went in last week I told him I was petrified of it coming back and he said he hopes that this is the end for me, but after all the money I've put into this, he wants to make sure we take the precautions and use some topicals. He gave me Aczone and Atralin. He actually filled a bag full of samples which I thought was awesome because I know last time I tried to get Aczone from the pharmacy it was like $300 or something. I really need to get better insurance. So I went to my psychiatrist on Monday and told him my worries and he wants to keep me on Wellbutrin for the depression for another 4 months because he doesn't want to take me off til I'm "completely calm". I wanted to be done, but I'm glad I'm not because it really does help me. On that note, I want to write my derm a thank you card. He is the 4th dermatologist I have been to since my early teens and he is the only one who has truly cared to stop this. 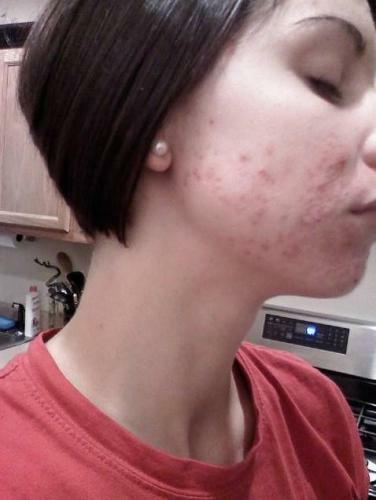 He (and the creators of Accutane) saved my life. and I mean that. I wished I was dead every single day last summer. This drug gave me a life I have never known. I can't tell you how good it feels to not have acne on my mind every minute of the day like before. I do still do my "mirror check" every morning when I wake up, but I don't lay there in bed feeling anxious and dreading what I'll see. I'm not afraid of mirrors anymore throughout the day. I can actually sleep over my family's house without being embarrassed of being in the bathroom too long. I could keep going but I will get to the pictures! ok some of these pics are really gross, I'm sorry. Here are some pics from last summer. 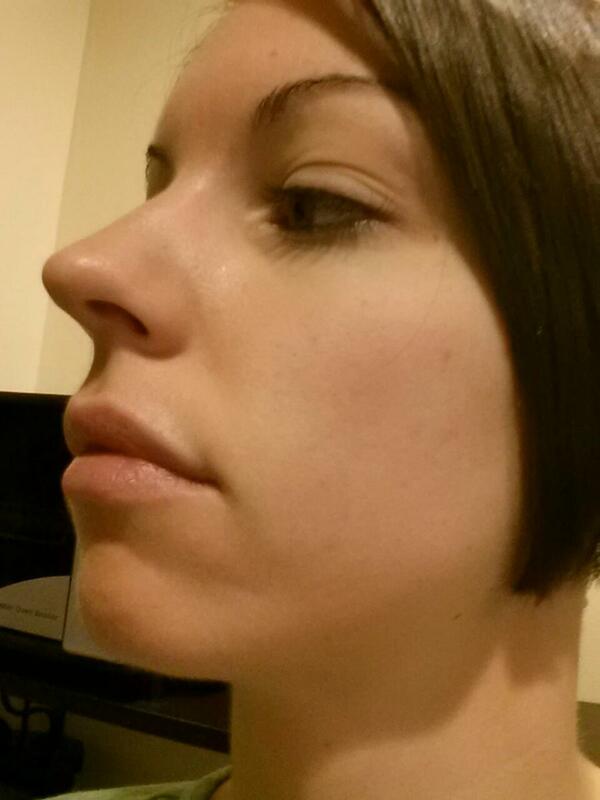 this first one is the result of my "water only method" and quitting the Regimen. it created an explosion of clogged pores all over my face, but covered my chin. Ugh, and this is July. Previous entry Day..? Month 6! thank you excelicious! =) your time will come! how much longer do you have? Girl you look amazing! You are so pretty! Did you experience any muscle pains? I'm on day 8th and my arms ache s bit and my right hand a bit too, and I'm only on 20 mgs! yes, my muscles hurt. they usually were ok during the day, but when i woke up in the morning my back would hurt so bad i couldn't lay there anymore. you can always take aleve or another anti-inflammatory to help. i didn't take anything though because it wasn't unbearable. my job is very physical too, i'm a massage therapist, so it's very possible my job increased the back pains. every time my dose got increased, my back hurt a little more. but don't let me scare you! it really wasn't bad. i actually got used to it. my back still hurts but i can feel it getting better. trust me, every side effect was worth it! my nose bled every day for the last few months. my course flew by, and i'm sure yours will too =) good luck! and if you need anything just ask. Thank you girl! Did you take any supplements like fish oil or glucosamine? Honestly I don't mind the effects as long as they are temporary, also I haven't exercised but I want to do continue doing yoga. Nope, I didn't take any supplements! I always wondered if I should, but never did. I was also still able to do my regular exercises with no problem. I did feel lazier, but after I worked out, I felt much better. just make sure you use a thick moisturizer! i used CeraVe moisturizing cream, it's in a big tub. One tub lasted me over 6 months using it every night. 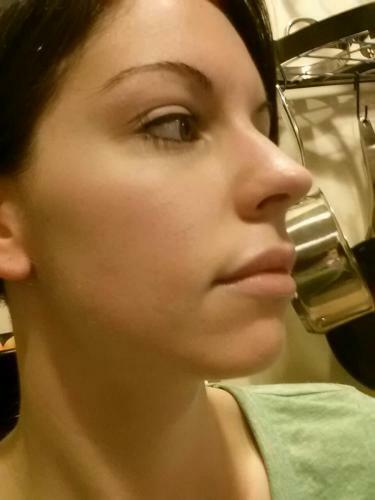 During the day, I used Aveeno Ultra Calming lotion, not as thick, but it really helped with the redness. Drink lotsss of water. 2 liters or more a day (depending on your size) usually you drink half your body weight in ounces. I tried to get 3 but usually would end up only having 2. In the beginning of my course I got really bad headaches til I realized I wasn't drinking enough. As soon as I chugged some water, the headache went away. If you get a rash on your arms or anywhere, use hydrocortisone. Your eyes are going to become dry, so get a bottle of moisturizing eye drops. The insides of your nose are going to dry out, so get some saline spray or you can use vaseline on a q-tip and wipe it around the inside of your nostrils. I used a saline gel, but vaseline works just as well. Thank you! I will see if I can get those in Canada. I hope you can drop by once in a while to keep us posted on how things are going. I know my time will come too, in the meantime stay healthy and happy! WOW. You look amazing. Did it even take care of scarring and discoloration, or are you wearing makeup in those last pictures? I have a huge problem with marks from old acne - mainly red dots rather than indented scarring. Congratulations! You're making me want to try this. you definitely should give it a shot. I really wish I had done this years ago. Accutane is my life saver. I do have some PIH, but it is fading and you have to look really close to see it. I do wear a little makeup on those spots (neutrogena skin clearing makeup). My derm gave me Aczone & Atralin to use and said these will also help fade them. I have a couple areas that have very mild indents, but again, you would have to be in really good lighting and tilt my face to see them. Do you use Benzoyl Peroxide? When I used that for 15 or so years, it made my PIH so dark. it would take months for them to go away. 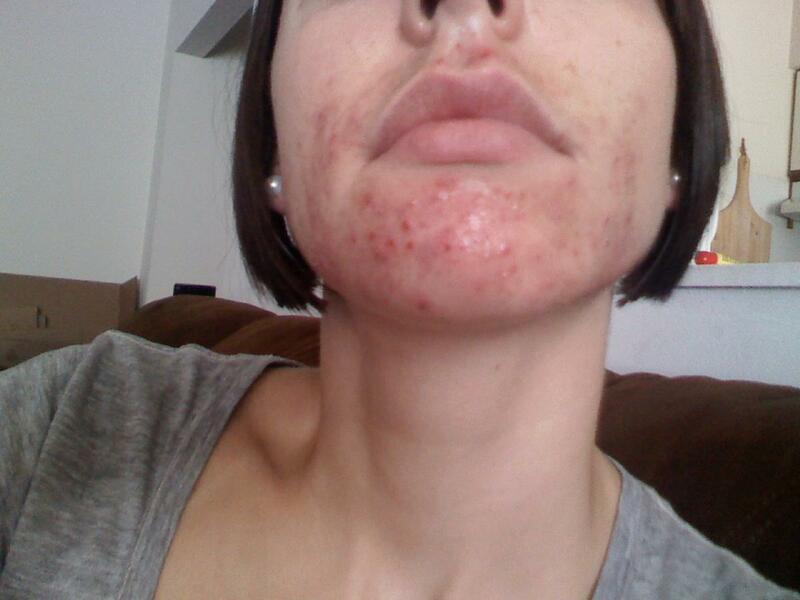 Accutane speeds up the healing process. I've seen a lot of people say that they notice a significant reduction in PIH in the months following Accutane. I also used benzoyl peroxide for about 15 years and I regret it. It was giving me premature wrinkles and I still had acne. Me too I wish I hadn't waited this long, I'm 39 if you can believe it, ...I was hoping I would grow out of it,....I will never get those years back. If I hadn't read all those horror stories I would have tried it many years ago! I really hate how the media has made it seem like an evil drug. Is your back feeling better these days? Are Your joints ok? I know! BP was giving me wrinkles, too! Before Dan's regimen, I only applied it all over my face in a regular quantity.... then Dan's regimen I slathered it on so thick. I started getting wrinkles around my eyes and I feel like I have more laugh lines now! lol or it could just be my age. I dunno. I was always afraid of Accutane, too. I got to the point where I was desperate, so side effects didn't matter. I have some weird muscle pains today, my middle toe has been hurting bad, seriously who gets pain on the middle toe? 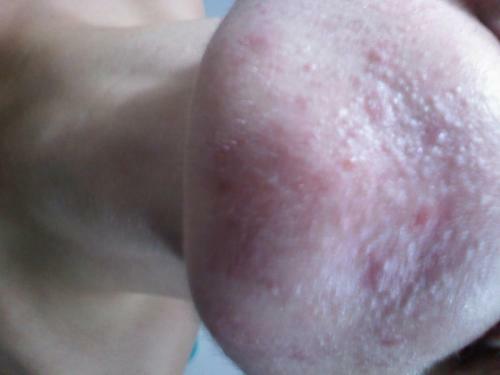 Also some back pain, neck pain, those are pains that i got every now and then before accutane, now they kind of linger. I also get tired when i do house chores, did this happen to you? I gotta ask my hubby to get me a maid, LOL. My lips are not bad, eyes and nose not dry at all, but I'm only on 20 Mg.
Did out get anxiety before the results of your liver test?, I'm freaking out for no reason , hey if it worked for Jessica Simpson and Salma Hayeck, it should work for me! And they both look pretty fine to me. I'm seeing my doctor tomorrow, wish me luck! Lol, yea middle toe pain is definitely weird! my eczema went away and so did my dry lips and eyes, but my nose is still really cracked inside and sore. if it doesn't heal soon I will get a prescription. I didn't get too worried about my blood tests because I stayed healthy and didn't eat crappy food the night before. I didn't drink either. but then the last few months I was a little worried that my results works would come back bad and I'd have to be taken off for a while. just eat smart and drink lots of water the day before and you should be fine! I had no idea those 2 were on Accutane! that's cool. I'm 23 now, and yeah I've been considering it exactly for that reason.. I'll never get these years back! Just trying to weigh the pros and cons. I've heard so many horror stories that I'm afraid of coming out on the short end of risking those long term side effects I've read so much about. So glad it worked for you though. Keep us updated on how things are going! Also, I noticed the same thing with BP. My red marks seemed much darker, and they lasted FOREVER. I even had the wrinkles around my eyes too. Scary stuff. You're right. They are years you won't get back. It's sad to think about it. Do you go to a dermatologist? Has he or she recommended Accutane? it's important to know the side effects and know that some people are left with long term side effects, but try not to focus on all the bad or you will scare yourself too much. It came to a point where I wouldn't let myself read the bad stories anymore and only read the good. it's completely up to you. Hi whatthehell! Is your back pain totally gone? Did you get pain in your heels? I could barely walk th other day, I just wonder if these pains go away as you adjust to the medicine! Haha it's whatthekell cuz my name is Kelli =P. hi catlover! I'm sorry I haven't been on here. it's so hard to log in because I'm having problems with my password. anyway, my back is feeling much better! I think any back pain I have now is just job related. I'm very happy about that because I was worried I'd always have back pain. I never had pain in my heels though. =/ definitely mention that to your doctor. try taking some Aleve. that'll help with any inflammation and take the pain away. How's everything else going? how much longer do u have? hi Kelli ) thank you so much for responding, most accutane veterans never come back to the boards once they are done. It's reassuring that your pain is gone, that means that my pains will be gone too once I stop,....or course I'm trying to be smart about it. my derm said the heel pain is more common in.....older people. damn. But just in case, I have been asking them to check the CK enzyme in my blood tests to check for muscle damage. I'm getting the results today, last month it came up fine. But the derm told me to go back to 20 mg:-(....I was doing 40 mg and I was almost at the end of month 3. I think she was concerned that It was painful for me to even go up and down stairs! i'm also having shoulder and back pain, I used to get it because of sitting at the computer and stress, but with the accutane the pain has also increased. could massage help? 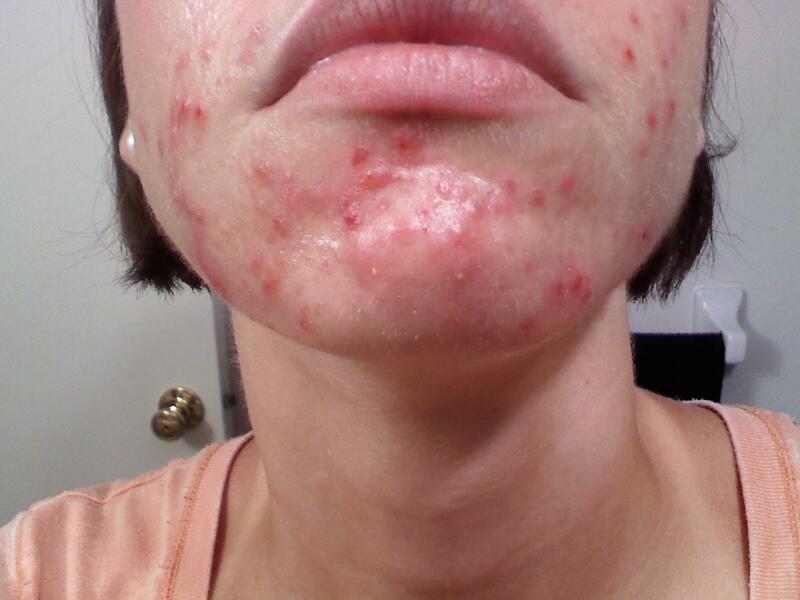 my derm couldn't tell me if it can help or not. I'm also taking tooooons of supplements: magnesium malate, L-carnitine, glucosamine, B50 vitamins, vitamin D, calcium, iron and fish oil. under 20 mg I may have another 5 months to go now! no problem! I created that blog to help people and want to keep helping anybody I can. =) maybe you should look into some dr. Scholz I think they're called? they're those inserts for shoes to make walking more comfortable. what kind of shoes do u normally wear? I definitely had a ton of back pain especially in my shoulders because that's where my back always hurts, so it intensified. and I even had lower back pain, which I never had before. but trust me, it's so worth it when you're done. massage will definitely help! ! too bad u couldn't come to the chiropractor I work for and I could give you one!